There are plenty of things to do in Puerto Rico but there is one adventure that stands out from the rest – night kayaking to Laguna Grande to witness the amazing bioluminescent phenomenon. 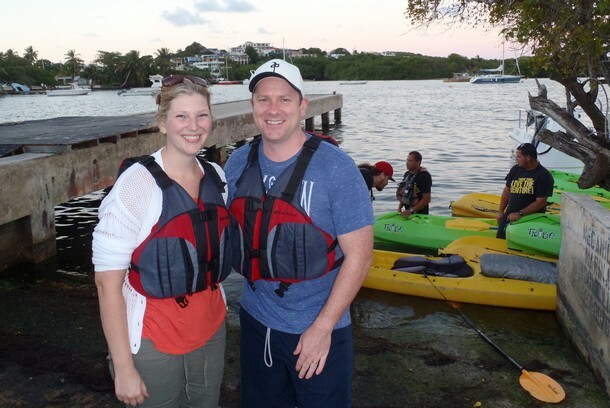 There are only a few places in the world that offer such an opportunity, so we made it a priority to include this kayaking adventure to our Puerto Rican itinerary. Laguna Grande, also known as Bioluminescent Bay or Bio Bay, is located just outside the city of Fajardo in eastern Puerto Rico, about 1.5 hour drive from Old San Juan. 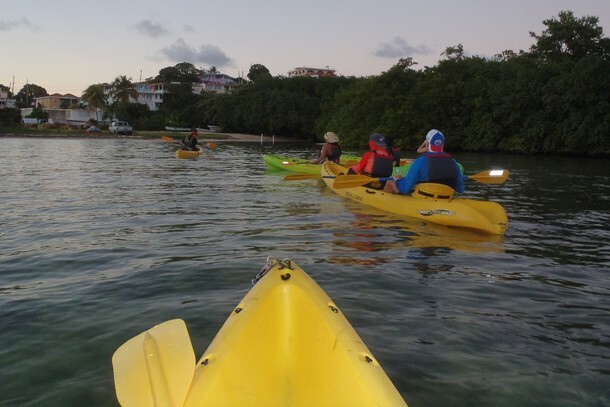 The bioluminescent kayak tour is very popular so there are several tour operators to choose from. We didn’t know what company to go with so we booked through Viator, a trusted online resource that connects people with local tours and activities. 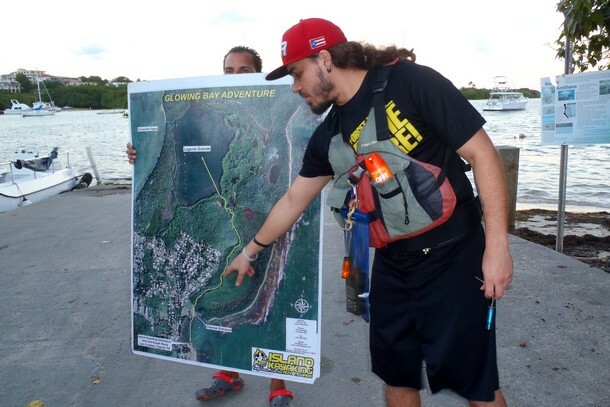 The Viator tour we booked is called – Bioluminescent Kayak Adventure from San Juan. 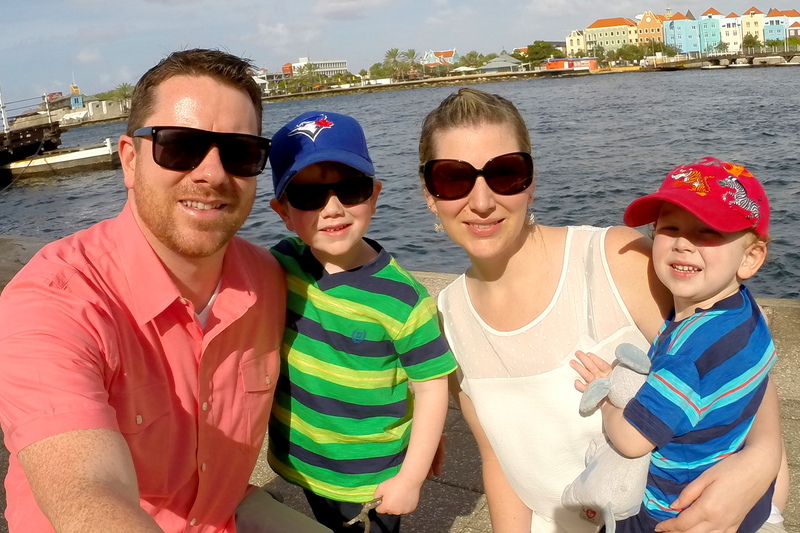 Nicole’s parents were traveling with us in Puerto Rico so we were fortunate to have babysitters on hand. This is not a baby friendly tour. We confirmed our pick up location a few days prior to departure time. The driver picked us up at 3:30 PM right in front of our apartment rental in the Isla Verde hotel area. We joined a few other guests that were picked up before us in Old San Juan. The vehicle was a comfortable 12 passenger van. The kayaking begins at a cove located just south of the Las Cabezas de San Juan Reserva Natural ‘El Faro’, a 316 acre protected reserve that’s home to rare flora and fauna and lush rainforest. We arrived early, which gave us time to take some pictures and grab a coffee. There are also a few vendors selling handcrafted souvenirs and snacks. As the sun began to set, our tour guide called us over to give us an overview of the evening. Our guide briefed us on the path we would take through thick mangroves to the lagoon, where we would attempt to witness the bioluminescent phenomena. I use the word “attempt” because it’s not a guarantee that you will see the glowing plankton. This is a natural event, so anything goes. It was one night before the full moon at the time we had this adventure, which is not the best time to take this particular tour. The bioluminescent plankton is best seen in complete darkness, so the bright moonlight can negatively impact visibility. It’s best to visit NOT during a full moon. We climbed into our double kayak around 6:00 PM, just as the skies turned a soft orange and pink. Our group was 6 kayaks, including our guide. We pushed off from a boat ramp and kayaked into the bay. There’s a small entrance to a mangrove channel that snakes through the protected reserve. We reached the mouth of the mangrove channel just as daylight was about to disappear. From a distance, you can’t see the entrance. It’s all blended together in a thick patch of greenery that looks like a forest. As we entered the mangroves everything became quiet, except for the sounds of frogs and birds. The deeper we went, the darker everything became. We felt as if we were kayaking through the heart of darkness. It’s an unusual feeling, kayaking in the dark. We feared our kayak would tip over and we’d be eaten by hungry crocodiles that were watching us from the tangled mangroves, but out guide assured us there are no creatures that could hurt us in the reserve. No crocs, no caymans, no sharks, no snakes. Phew! The only thing to fear is the pesky mosquito. The channel isn’t very deep either. In the unlikely event your kayak does flip, you’d be able to stand up with your head above water. It looked no more than 3 feet deep and the water was quite warm. Our group slowly paddled through the mangroves and made our way to the lagoon. I didn’t time it, but I would guess it took about 40 minutes to reach the lagoon. Even though the lagoon is surrounded by land, the water is from the ocean. Our guide explained how the plankton travels through the channel at high tide and then gets trapped in the lagoon once the water flows back out at low tide. It’s a fascinating process that happens at only a few locations around the world. We continued to paddle across the calm waters of the lagoon. To witness the bioluminescence it requires complete darkness. After about 15 minutes it was dark. It was a little eery sitting in a kayak in the pitch black. It was certainly a first time experience. It was one night before the full moon so the moonlight was at almost full strength, which is not ideal conditions. The moonlight sparkled on the water, making it virtually impossible to see the bioluminescent effect. Fortunately, our guide came prepared for such conditions. We gathered together and put our kayaks side by side. He then rolled a giant tarp across our makeshift island of kayaks. We pulled the tarp over our heads like a big cocoon and sealed out the moonlight, creating complete darkness. Once we had the darkness, we dipped our hands in the water and slowly moved them hands back and forth, stirring up the plankton. This motion disrupts the surface of the water and ignites the bioluminescence. The water sparkled with each stroke. It looked as if there were tiny fire flies flickering underwater. Sadly, we could not capture this moment on camera. It was too dark. After about 10 minutes in the tarp cocoon we packed up and began our paddle back to the mangrove channel. It was a completely different experience on the return trip. This time, we were paddling in complete darkness! 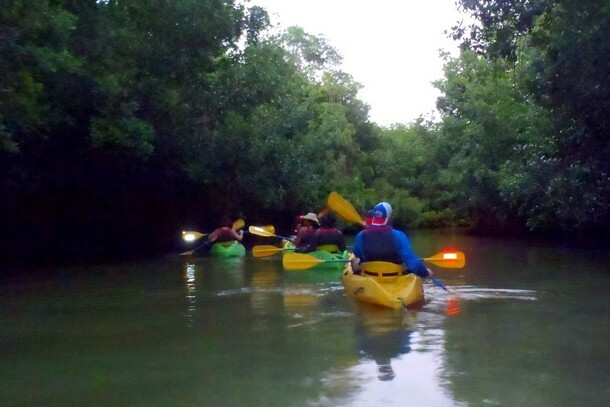 We navigated through the mangroves by following a light that was fixed on the back of each kayak. One by one we floated through the eerie darkness, surrounded by the sounds of night creatures hiding in the mangroves. We knew nothing in the water could harm us but that didn’t stop our minds from playing tricks on us. Every few minutes a fish would jump out of the water and scare the crap out of us. It was an awesome one-of-a-kind experience that we highly recommend! We booked this tour through Viator. There are several operators offering an identical tour. Viator handpicks local tour operators with strong reputations and it offers a low price guarantee. 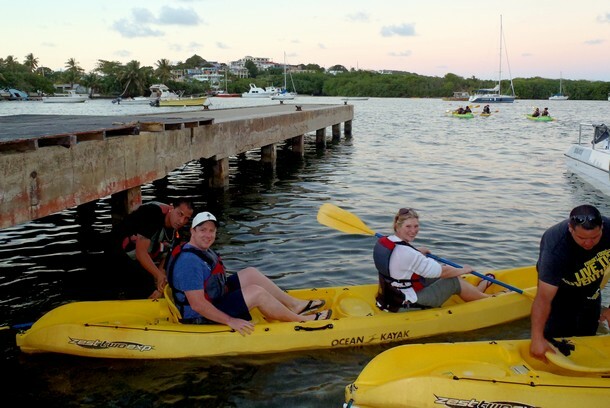 The tour includes kayak rental, knowledgeable tour guide and transportation to and from your hotel. The kayak will get wet, so wear comfortable clothing that can get wet. Aqua shoes are ideal but you’ll be fine with sandals or flip-flops. Bring a change of clothes for the drive home. A towel is a good idea too. We left our bag in the van when we were on the water. You don’t want to bring any valuables with you on the kayak because they could get lost if the kayak flips. 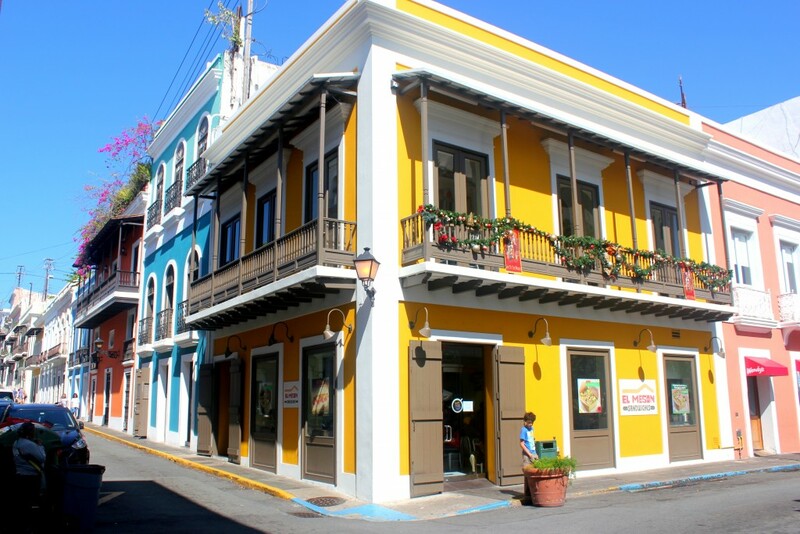 The tour departs from most major San Juan hotels between 4:00pm and 6:00pm, depending on where your hotel is located. The drive takes about 1.5 hours. You will need to bring US$3 in cash to pay for the park entrance fee. The tour allows kids but they have to be minimum 6 years old. If our boys were that age we would feel totally comfortable having them join the tour. It’s a safe adventure. Bottled water and cookies were provided after the kayak adventure. It’s not a bad idea to bring some extra food with you for the drive home. We brought our water proof camera. We did not trust our phones or DSLR camera in the kayak. We had our GoPro camera with us but decided to leave it in the van because it’s not very good in low light situations. Our waterproof camera isn’t much better but it allowed us to capture a few good images. Have you ever witnessed bioluminescent plankton? What about kayaking in the dark? We have friends who live in Rincon, Puerto Rico (the northwestern corner) and were going to do a boat ride in a bioluminescent area in Southern Puerto Rico but were told it wasn’t so great. So this is good to know for our next visit. Can’t wait! The bioluminescense was okay, but not mind blowing. We were there at full moon, so it was probably the worst time to go (but we didn’t plan our trip on the moon calendar). The kayaking part was the most fun. The mangroves are awesome and it’s super eerie kayaking in the dark. Wow this green kayak is ammazing. That must be really nice. Kayaking in dark must be good enjoyment. I cant belive this cost only US$3 =)) Nice blog thank you! The $3 fee is for entrance to the park. The guided tours range in price, depending on who you use. 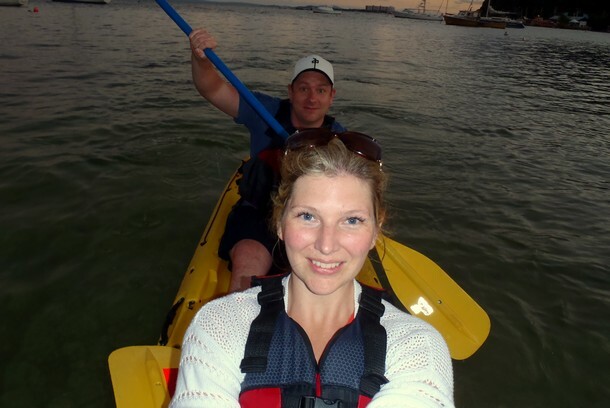 Kayak tours are so much fun, especially during summer! The bioluminescent plankton seems very interesting! Puerto Rico is a great place, Though I couldn’t go there for once. But you told a lot of description about it. I wish I will go there as early as possible and take a kayak tour as like you. It’s great to know that there aren’t any creatures that can harm you in and around bio-luminescent bay. I remember hearing about how amazing this place was from my mom when she went to Puerto Rico, she also got to kayak to the bay. Was there much of a price difference between the different tour guides to kayak? Did you have to sign a waiver at all and if so what did it state? My husband and I did this about 10 years ago and we thought it was fantastic. The plankton was easy to see and we got to swim in the lagoon for about an hour. My husband swam circles around me under water and he looked like an eerie ghost swimming through the water. You can actually here the static discharge of the plankton if you put your head underwater. This was one of the more memorable experiences that I’ve had.